The War No More Machine! Later, Diana reports to Morgan Tracy’s office and he grimly tells her that the USA, Russia, Red China and indeed, all the other countries on earth have been struck by a sudden, inexplicable epidemic of peace! Diana replies that the news is wonderful but Morgan says that initially he had thought the same, until he discovered that the peace is involuntary, overwhelming to an almost crippling degree. He plays Diana a video tape of Brazilian farmers, who normally spend each season bravely fighting of the yearly swarms of locusts. But this time they are fleeing in blind panic. Another clip shows two black belt martial artists who were scheduled to give a karate exhibition but instead, refuse to lift a hand against each other. Another clip shows the Eskimos who have lost their will and drive to hunt and kill for food in order to stay alive. Diana is amazed that these ‘super-pacifists’ are finding they are unable to defend or help themselves at all. Tracy informs her that only the UN Crisis Bureau know the full extent of the problem, as each country believes the problem is exclusive to them. He tells her that White House advisor, Dr. Hans Krissen is due to land at the airport within the hour to discuss the crisis at a strategy meeting and Diana suggests she meets him on his arrival. Meanwhile, as Diana sets off, (secretly followed by the Flash in his monitor capacity) a hijack is taking place in the skies above. Marty Tragg produces a gun and tells the pilots that he is taking over the plane. But he is surprised when they simply freeze in fear, unable to resist him. As they do so, the aircraft begins to dive out of control and Tragg finds he is unable to do anything about it. On the ground, Diana Prince makes her way along the busy freeway when she suddenly sees the 747 spiraling out of control. 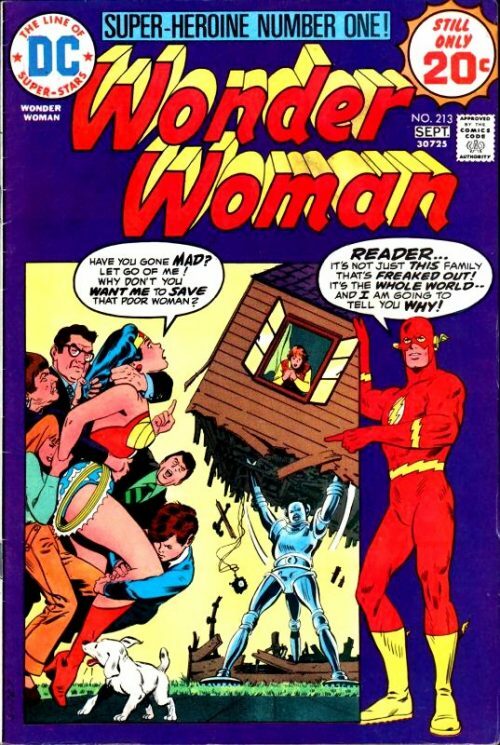 The watching Flash realises that she cannot transform into Wonder Woman without exposing her secret identity to the other drivers. She therefore mentally summons her invisible plane which instantly swoops down and deposits clouds of bellowing black smoke on the freeway. During the smoke screen, Diana uses her lasso to change into her Wonder Woman costume and leaps onboard her waiting jet. She flies alongside the plummeting 747 and lassos it, using all her strength to pull the plane out of its dive before towing it onto a runway for a safe landing. Inside, Tragg remains undaunted and declares that he will use the jet as ransom to pay off his half-million dollar gambling debt. But Wonder Woman, who has already spotted his gun through the cockpit window, crashes through the roof and disarms him. 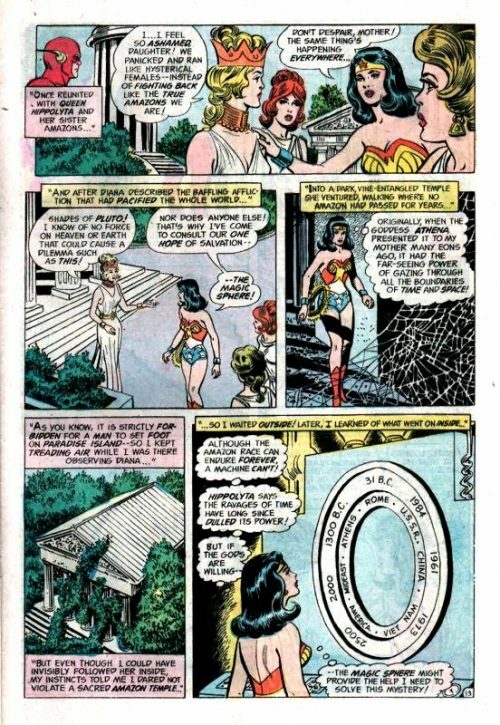 As Tragg is then arrested by the authorities, Wonder Woman slips away and manages to change back into her Diana Prince guise in order to greet Dr. Krissen, who was also onboard the saved airliner. 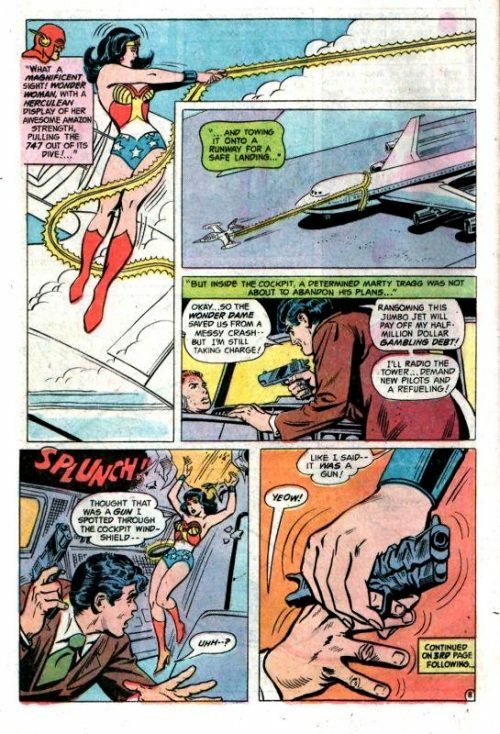 As Diana drives him back to the UN Crisis Bureau, he recounts the story of how Wonder Woman saved the plane and how the crew and passengers were so timid and submissive, himself included. Diana replies that this behavior fits the pattern reported worldwide and that even criminals were becoming peaceful pacifists, cutting the crime rate to zero! Mysteriously, however, the skyjacker, Marty Tragg did not seem affected and they both agree that this requires further investigation once the strategy meeting has been held with Tracy. While the meeting takes place though, Diana manages to slip away and as Wonder Woman, flies home to Paradise Island. She muses that it is not only Marty Tragg that seems to be immune from the strange phenomena – but also herself too. As she arrives at the Amazon’s Island home she sees a wild Rhinotaur on the rampage, charging at the other Amazons who are fleeing in panic. 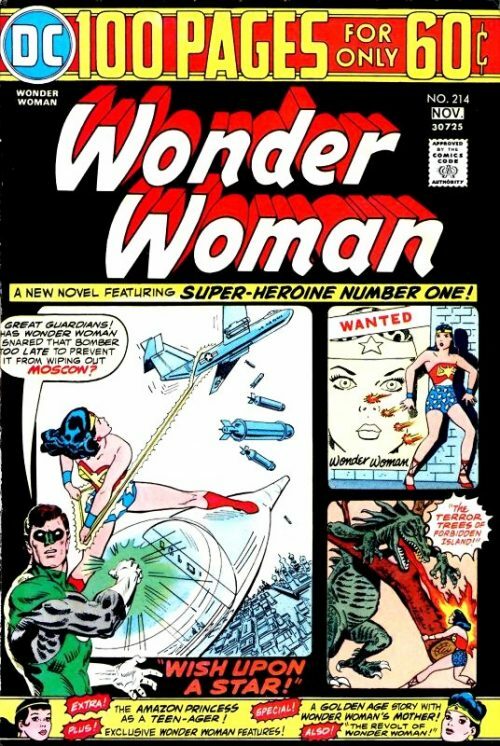 Wonder Woman lassos the beast and after a struggle, she calms the Rhinotaur down. 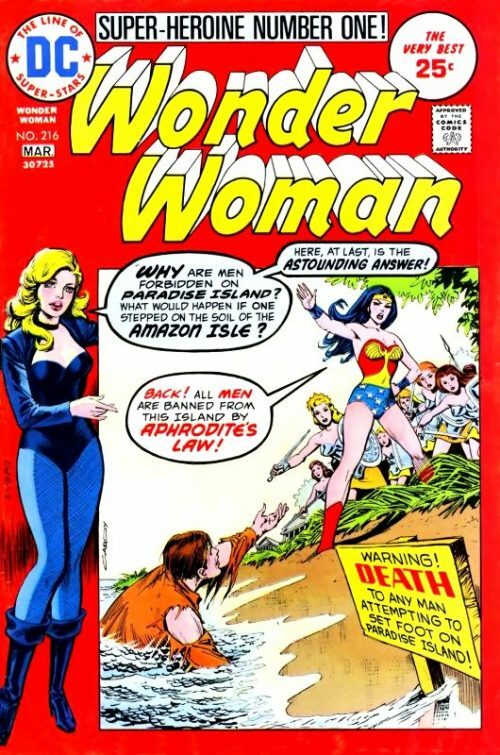 The next day, Marty Tragg finds himself released from jail and under the temporary custody of Wonder Woman and later, she also collects Angie Blake from the middle of an antiwar rally. She takes them to an isolated hill in Northwestern New Jersey where the magic sphere is now also resting. She tells the two of them that no mortal has ever seen it before and that they are both here because the three of them are the only people on earth who can save mankind! She tells them to watch the magic sphere and it will reveal all. It seems that two days before, a giant cybernaut landed in the grand canyon from some unknown planet. Its purpose was to send out a split second barrage of instantaneous beams all over the world to pacify the population. The three of them were spared the effects due to a freak combination of pain in the presence of lightning; the car hitting the lamppost, the splinter from the placard and the trip up the kerb – all during the flash of lightning! When Wonder Woman explains that they are the only people left who can stop the cybernaut, they both refuse to help. 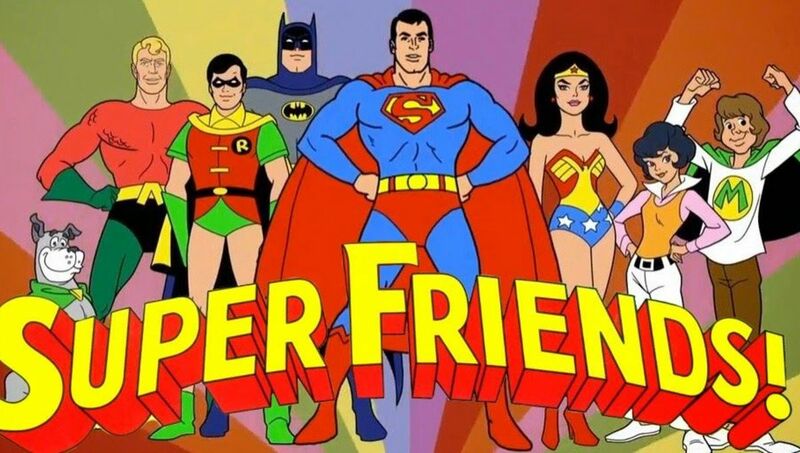 But Wonder Woman uses her lasso to compel them to join her and after a short flight in the invisible jet, they arrive for the showdown with the cybernaut. The Amazon Princess tells them to wait by the plane and if anything happens to her, they must escape and warn the rest of the world. 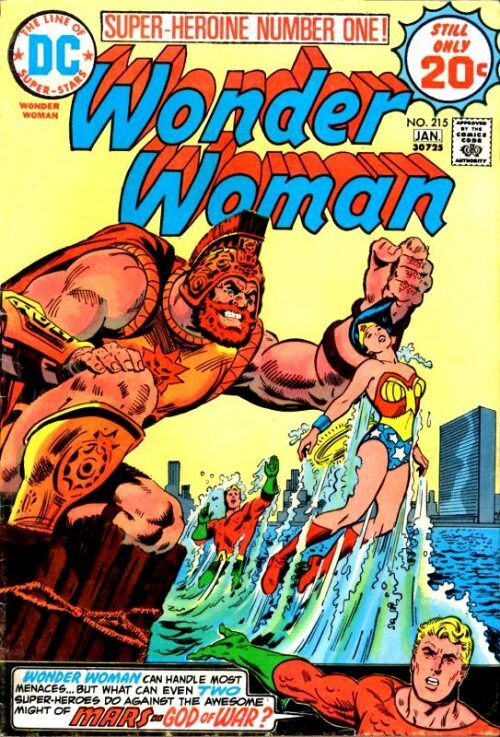 Cautiously, Wonder Woman approaches the immobile giant under the watchful gaze of the Flash. Suddenly, it fires a beam at the Amazon, knocking her off her feet. As she tries to recover, the cybernaut advances and picks her up, holding her aloft over its head. With immense power, it hurls her into the ground feet first so that she finds herself buried up to her neck! With her strength sapped by the ray blast, she realises that she is unable to free herself. The cybernaut in turn, moves towards her while lifting one of its massive legs, intent on squashing the helpless Amazon. 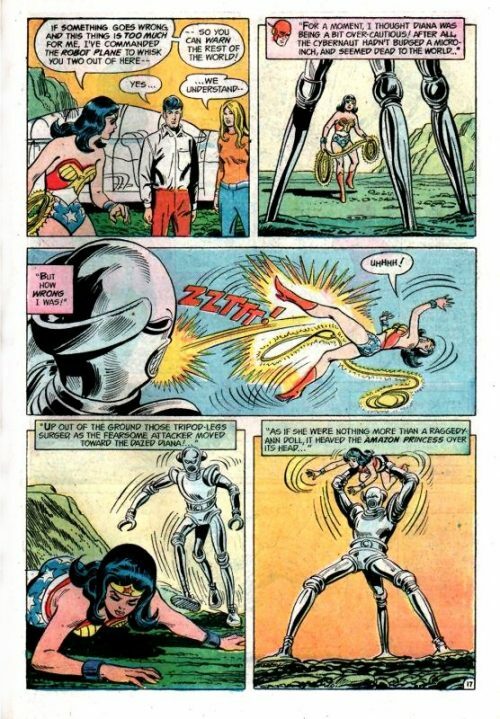 Seeing Wonder Woman’s predicament, a pacified Flash tries to intervene but finds himself unable to make a hostile move towards the cybernaut. Suddenly, Marty and Angie rush over and, picking up Wonder Woman’s lasso which had fallen on the floor during the attack, ensnare the cybernaut and pull it over. 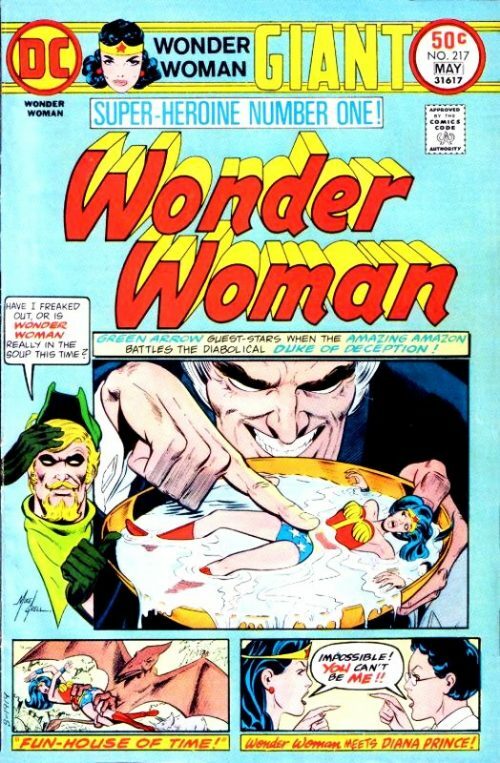 While it tries to get to its feet, they pass the lasso to Wonder Woman who commands it to corkscrew its way up through the air, wrenching her free. She quickly moves to encircle the cybernaut with the golden lariat until it finds itself cocooned in the unbreakable rope. It finally topples over in defeat. 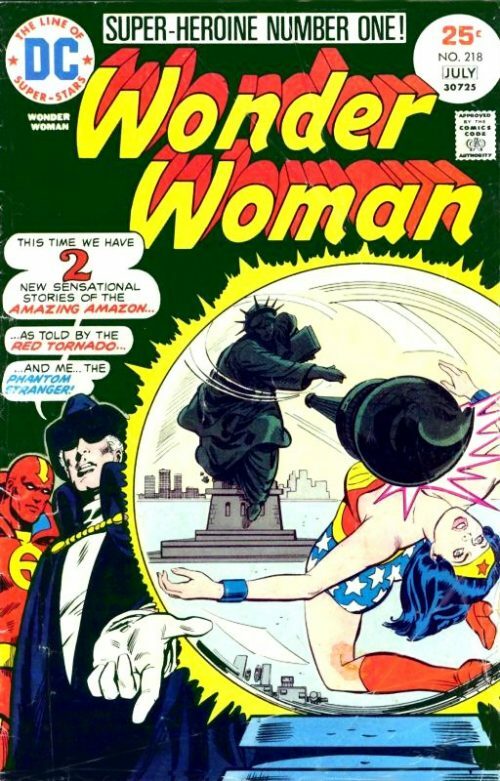 Wonder Woman thanks her unlikely allies and then, with the help of Flash, she reconfigures the cybernaut’s electronics to send out a counter ray across the world to nullify the pacifism effects.